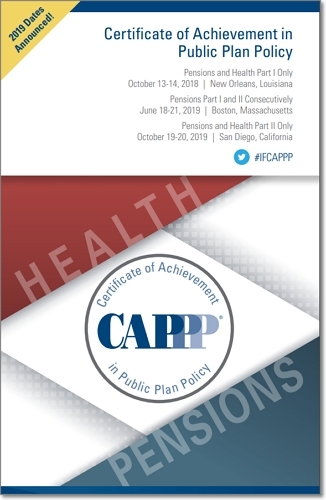 Click the image above to download the 2019 Certificate of Achievement in Public Plan Policy brochure. Your OEA sponsors scholarships for members interested in pursuing seats on the boards of the State Teachers Retirement System of Ohio (STRS), the Ohio Public Employees Retirement System (OPERS), or the School Employees Retirement System (SERS) systems. These scholarships cover the cost of the training sessions required to complete a Certificate of Achievement in Public Plan Policy (CAPPP), as well as other related trainings and/or meetings. Attendance at STRS, OPERS or SERS board and committee meetings and/or service on a public retirement system board. The Retirement Systems Training program is conducted by the International Foundation of Employee Benefit Plans (IFEBP), the largest educational association serving the employee benefits and compensation industry, will conduct the training program. As nonprofit, non-lobbying organization, the foundation is a trusted resource for objective, accurate and timely information. The scholarship program is administered by the Office of the OEA Vice President. Applications are due July 12, 2019. We encourage you download the 2019 Certificate of Achievement in Public Plan Policy brochure.